Hosting a bridal shower or girl’s birthday party? Looking for DIY cake ideas? Try this easy, DIY pull-apart cupcake dress! The perfect alternative to a traditional cake. Bake cupcakes and allow to fully cool. While cupcakes cool, make frosting and set aside. Set up board and embellishments. Once cupcakes are cool, begin to arrange cupcake on board like the picture below. Depending on the size of the cupcakes, you may have to play around with the exact number of cupcakes so that they fit. Don’t worry about spaces and gaps, you will fill those in with frosting after! Cooling down waiting for frosting. Once you have the cupcakes set up the way you like, begin securing the cupcakes to the board by spreading a dab of frosting to the bottom of the cupcake. This is important so the cupcakes don’t slide around! Now here comes the fun part! Fill pastry bag with frosting and begin covering your cupcakes. To create the flower look, start at the center of the cupcake and move outward in a circular motion until the entire cupcake is covered. Repeat until the all of the cupcakes are covered. For a great tutorial, visit https://youtu.be/F8Kv-uXxK68! Now let’s cover those gaps! Pipe frosting between the cupcakes that have gaps until you feel satisfied! Once all the gaps are filled, add your embellishments! In the photo below, I used silver candy pearls at the center of the roses and white candy pearls at the neckline and at the waist. I also added a purple satin flower to add some color. Once you’ve finished adding all of your final touches, slide the board carefully into the box and Voila! You have yourself a beautiful cake! In box on our way to bridal shower! 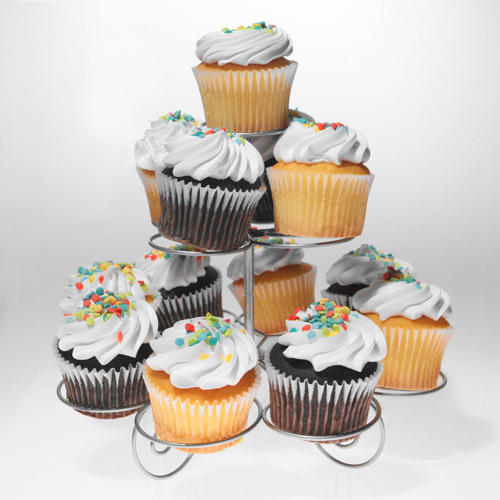 To Augment your beautiful DIY Cupcake Dress, you may consider making extra cupcakes and displaying them with our Cup Cake Stand. See image below. 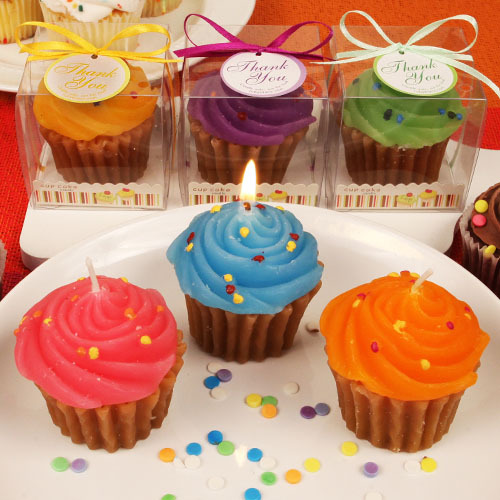 Or add our “Cupcake Time” Scented Candle around the room or the cake. See image below.